Prince Albert Victor Christian Edward (known as "Eddy" to his friends) is one of the most famous suspects in the Jack the Ripper case, figuring in no less than three major theories. Over the years, different versions of his personality, mental stability, and manner of death have appeared. 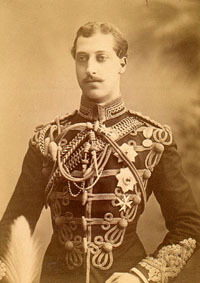 Eddy was born in 1864 to Prince Albert Edward (known as "Bertie"and son to Queen Victoria --Bertie would later become King Edward VII) and Princess Alexandra. Bertie was well known by the English public and not highly respected by many of the lower, and some of the upper, classes. He had a reputation for being a 'ladies man' and was rumored to have been a party to many a scandal that was hushed up by the Palace. Princess Alexandra, on the other hand, was an equivalent to today's Princess Di in that she was much loved by the public who had great sympathy for her having to put up with the antics of her husband. There were unconfirmed rumors that Eddy was mildly retarded. That his intelligence was lower than expected of a future monarch is not disputed and it is believed that this limited mental ability was one of the reasons why he required a tutor at Cambridge. He was partially deaf, owing to inherited hearing problems through his mother's side of the family. He had an unusually long and thin neck which required him to wear long starched collars and led to him receiving the nickname, "collars & cuffs". Eddy was named Duke of Clarence and Avondale in 1891 and would likely have followed Bertie to the throne had Eddy not fallen victim to the influenza epidemic of 1891-92. The death was especially ironic as Eddy had become engaged to Princess May of Teck (eventually to become Queen Mary) in December of 1891. During Eddy's lifetime, there were rumors regarding his lifestyle, intelligence, and physical health but nothing was ever proven. During the time of the Ripper murders, there were no actual theories presented linking Eddy to the crimes. Those would come much later after many of the principal characters in the theories were dead. It would not be until 1962 when the first theory regarding Eddy's involvement in the murders became known. According to Jack the Ripper: A to Z (Begg, Fido, and Skinner), the first allegation comes from Phillippe Jullien in his book, Edouard VII. In it, Jullien remarks that "the prince and 'the Duke of Bedford'" (A-Z, pg. 16) were rumored to be responsible for the murders. I cannot find any details on this mysterious "Duke of Bedford" to corroborate this remark. This thread was taken up by Dr. Thomas Stowell who, in 1970, published an article in The Criminologist called "A Solution". It created a sensation by his veiled accusation of Prince Eddy as the killer. Stowell apparently used the private papers of Sir William Gull as his primary source material and it was these papers which led him to devise his theory. Throughout his article, the killer is referred to as "S", but there is enough internal evidence to identify Eddy as his chief culprit. According to Stowell, Eddy was suffering from syphilis, contracted during a shore party in the West Indies, and that this infection drove Eddy insane and compelled him to commit the murders. In this theory, the Royal Family knew that Eddy was the murderer "definitely ... after the second murder, and possibly even after the first" (Rumbelow, p 196). Eddy's doctor in this matter was supposedly Sir William Gull who informed Bertie that his son was dying of syphilitic infection. Apparently no attempt was made to restrain Eddy until after the Double Event when he was bundled away in restraints to a private mental hospital. Eddy then escaped to carry out the Kelly murder after which he was again locked away and died, not of flu in 1892 as claimed, but of "softening of the brain" in a private mental hospital in Sandringham. Stowell goes on to include Eddy's resemblance to Druitt and the eye-witness accounts of the Ripper as proof positive. While a neat and tidy theory, later Ripperologists have poked several effective holes through it. To begin with, Stowell claims of using Gull's private papers cannot be substantiated due to Stowell's death within days of publishing his theory and the burning of his own papers (unread) by the family. With the lack of the papers, Stowell's claims of Eddy being homosexual (and nearly escaping prosecution in the Cleveland Street scandal) and of Eddy's contracting syphilis cannot be confirmed. Adding more confusion, Stowell used Gull's papers for his theory but Eddy supposedly died in 1892 and Gull in 1890 so Gull could not have been able to comment on the cause of Eddy's death. If the theory is true, Gull could be a source of confirming the infection but not necessarily of it being the cause of Eddy's death. Being the two most important parts of the theory, their elimination severely weakens the case. More importantly, examination of court and Royal records reveal that Eddy was not even in London on the important murder dates. "1 November: Arrived in London from York. Stowell argues that the Ripper's skill at dissection was obtained through Eddy's experience at "dressing deer". A far leap in logic. Despite the implausibility of Eddy actually being the Ripper, he was named as the infamous killer in yet another book: Prince Jack by Frank Spiering. This strange book takes the basic thrust of Stowell's theory, clearly naming Eddy as the killer, and goes even further. Spiering claims to have found a copy of Gull's notes in The New York Academy of Medicine in which, supposedly, was a report of Gull hypnotizing Eddy and watching horrified as Eddy acted out the murders. From this, Gull went on to diagnose Eddy as having syphilis and that the accompanying pain was driving the Prince out to commit the murders in fits of fantastic rage. Spiering goes on to suggest that Lord Salisbury, in possibly collusion with Bertie, had Eddy killed by a morphine overdose. Rumbelow states that the book was called "Grade Z fiction" by the American reviewer, Dale L. Walker and that Spiering's own response to the criticism was to claim that the papers also included Eddy's confession to Gull which was not mentioned in the book. Following this claim, both Walker and Rumbelow attempted to trace the existence of these Gull documents but were informed by The New York Academy of Medicine that "'None of the entries in our catalog for works by or about Sir William Gull contain the material referred to by Mr. Spiering." The response to Rumbelow's request mentions that it is not inconceivable that the material could have been misplaced "but it is highly unlikely". Rumbelow goes on to show that Spiering's research was sloppy at best and therefore discredits much of the theory. In 1978, Spiering issued a challenge to Queen Elizabeth II to reveal the truth about Eddy. Either she should open the Royal archives or hold a press release detailing the Duke's activities as the Ripper. When a Buckingham Palace spokesman stated that Spiering could examine the Royal Archives (as other researchers had done) but that the accusation were "not sufficiently serious to warrant a special statement from the Queen", Spiering replied that he didn't want to see the files. Leaving Rumbelow and others to deduce that the entire episode had been orchestrated to sell copies of the book. Since then Spiering has not made any further claims or produced any further evidence supporting his theory. Having survived accusation as the Ripper, Eddy now moved into the role of supporting player to the murderer (or murderers) in two separate theories. The first involved his old Cambridge tutor, James K. Stephen and was initially made in Michael Harrison's biography of Eddy, Clarence. According to this theory, Harrison had gone over Stowell's article and come to the conclusion that "S" was not Eddy, but actually Stephens who was committing the murders "out of a twisted desire for revenge" because of the dissolution of a homosexual relationship with Eddy. The relationship supposedly ended when Eddy was gazetted to the 10th Hussars on June 17th, 1885. There appears to be no further incident until two years later when Stephen had a mysterious, and eventually fatal, accident. Separate descriptions of the accident exist. Virginia Woolf's biographer, Quentin Bell, says that the family tradition was that Stephen was struck in the head by some object from a moving train. Harrison claims that Stephen was injured when a horse he was riding shied and backed him into the moving vane of a windmill. Whatever the case, the accident was a major one and required a great deal of care. Although he originally appeared to have made a complete recovery, it was later discovered that his brain had been permanently damaged and Stephen was slowly going mad. At this point, Stephen becomes a patient of Sir William Gull (Rumbelow places it after Gull's first stroke in 1887) and begins a rapid mental and physical decline. Stephen drifts from one project to the next with little focus or interest. It is during this period that Stephen writes two volumes of poetry that include extremely violent images against women. Stephen was committed to a mental hospital in 1891, where he died the following February. Harrison contends that the breakup of the relationship with Eddy, combined with the accident, provoked Stephen to try and avenge himself upon Eddy. Why he would pick such pitiful women is not sufficiently answered. Harrison argues that the murders are a kind of blood sacrifice through an elaborate explanation that includes a savage deity named the Great Mother, the Roman God Terminus, the relation of Frances Coles name translated into Greek, and Stephen's pamphlet in defense of the compulsory study of Greek at the universities. Harrison goes on to state that the Ripper in fact murdered ten women (to fit into his theory he included Alice Mackenzie, Frances Coles, Mellett or Davis and Annie Farmer) but Rumbelow disputes this counting as Stride and Eddowes are counted as one and Annie Farmer was not murdered at all. The ten women theory was important because Harrison believed that Stephen was acting out his own poem "Air: Kaphoozelum" in which the song's villain kills ten harlots. Not to be outdone, the Eddy/Stephen theory resurfaced in David Abrahamsen's book, Murder and Madness, The Secret Life of Jack the Ripper. Abrahamsen was a forensic psychiatrist who developed a psychological profile of Jack based upon the murders and what little evidence was left behind. His conclusion that the murderer was insane and that the murders were sexual in motive was not anything new even though he did give some new interpretations of some of the evidence and method. Where Abrahamsen fails is that he then takes the profile and goes looking for someone to match it! Stephen is the only logical choice because he is the only one of the KNOWN suspects who matches the profile. This ignores the fact that the Ripper could still be someone unknown to us at this time. Even more, Abrahamsen claims that Eddy was an accomplice in the crimes and that he and Stephen enjoyed a mutually dependent relationship with Stephen being the dominant partner. As the theory is based virtually completely on psychological conclusions, the lack, or contradicting nature, of some remaining evidence. Eddy is unlikely to have been the source of Stephen's lovesick murder madness, but Eddy returns in what is the most popular theory to date. The Royal Conspiracy theory first appeared in 1973 in the BBC programme, Jack the Ripper. In it, fictional detectives Barlow and Watt finally solve the Ripper mystery through a series of conspiracies and cover-ups. The story goes that the producers of the program, in doing research, were told to contact a man named Sickert who knew about a secret marriage between Eddy and a poor Catholic girl named Alice Mary Crook. Sickert painted a strange story involving Eddy, Lord Salisbury, Sir Robert Anderson, Sir William Gull, and even Queen Victoria herself! The man, Joseph Sickert, was the son of famous painter, Walter Sickert, from whom he reportedly got the story. Sickert had lived in the East End during the time of the murders and was supposedly a close friend of the Royal family. Princess Alex asked Sickert to take Eddy under his wing and watch out for him. Sickert eventually introduced Eddy to a poor girl named Annie Crook who worked in one of the local shops in Cleveland Street. Eddy soon got the girl pregnant and they were living quite happily with their daughter Alice until the Queen discovered her grandson's indiscretion and demanded that the situation be terminated. Not only was Annie a commoner, but a Catholic as well and there was belief that news of a Catholic heir to the throne would spark a revolution. The Queen gave the matter to her Prime Minister, Lord Salisbury, to solve and he, in turn, went to Sir William Gull. After a daring raid on the Cleveland Street love nest, Eddy was taken away and Annie was sent to one of Gull's hospitals where Gull performed experiments on her designed to erase her memory and drive her insane. Their child, however, escaped the raid unharmed with her nanny, Mary Kelly. This time, Gull devised an elaborate scheme to silence the women based on Masonic rituals. Enlisting the help of John Netley, a coachman, he created Jack the Ripper as a symbol of Freemasonry. Sir Robert Anderson was enlisted to help cover up the crimes and act as lookout during the murders. The murders would be silent messages about the power and strength of Masonry and the fate awaiting any who opposed them. Eddowes, Sickert said, was a mistake. She often went by the name of Mary Kelly and it was a case of mistaken identity. Once the truth was known, the real Mary Kelly was found and silenced. The conspiracy closed in upon itself and chose M.J. Druitt as a scapegoat to take the blame and, Sickert hinted, Druitt was murdered for it. The girl, Alice, grew up and later, by an odd series of twists and turns, married Walter Sickert and gave birth to Joseph. The program caused a sensation and lead directly to the publication of Stephen Knight's controversial book Jack the Ripper: The Final Solution in 1978. In it, Knight tries to prove that the conspiracy not only existed but that the third man in the murder triad was not Sir Robert Anderson, but Walter Sickert himself! The Knight theory, though interesting and entertaining in its own way, has been effectively debunked by many Ripperologists. Most notable was Rumbelow's refutation in his revised edition of Jack the Ripper: The Complete Casebook where Rumbelow provides evidence that Annie lived longer than Knight claims, spent time after 1888 in workhouses, and had Alice with her through some of this time. There are no marriage or birth records listing Eddy as Annie's husband or as Alice's father. Aside from rumor or secondhand statements, there was never any hard evidence linking Eddy to Cleveland Street, Annie Crook, or even Walter Sickert. The lack of evidence, conspiracy theorists purport, proves the theory because all evidence was destroyed! Regardless of the legitimate criticisms, the Royal Conspiracy remains one of the most popular theories with several movies, novels, and graphic novels built around it. In the end, it is difficult to consider Eddy a serious suspect. Although rumored, there is no concrete evidence that Eddy had mental problems (either through syphilis or any other reason), he is reported being out of the country during the murders, and no solid evidence has been produced that links Eddy to sexual relationships with either James Stephen or Annie Crook. Despite these facts, it appears likely that (outside of serious Ripper circles) the theory of Eddy's involvement in the murders in some way will never completely fade.